A small eat and a seat please? Café chains are a strong sign of westernisation and the indicator of a modern world. I must say I don’t have anything against fast food chains, coffee chains or chain stores. My favourites include Eat, Wagamama and right now I am dreaming of lunch at Bristol’s Pieminister. Within walking distance from my Indian home there’s a small joint selling traditional South Indian fare called Cambridge Continental. It’s the local version of a greasy spoon minus the plastic seats and with an Indian menu. Patrons eat from metal plates lined with a banana leaf whilst standing up. And they serve idlys, by far my favourite all-day-Indian-breakfast item. The local juice corner serves delicious fruit juices. 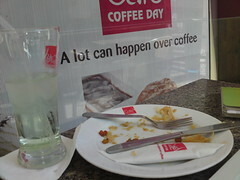 So what am I doing at Coffee Day which is further, and has served me a micro-waved massala roll with a green apple lemonade?? …It’s because they have seats, tables and a roomy terrace and this is what I am after. But, as I sit relaxing in relative luxury, I feel my resentment for Coffee Day developing, swiftly matching my negative feelings towards Starbucks. As far as local chains go, I prefer the Java City’s branch on Lavelle Road. They have a better choice of food and their interior and outdoors area are more comfortable; better for laptop use. Barista serve a good mint tikka sandwich and a decent tea and they open early. 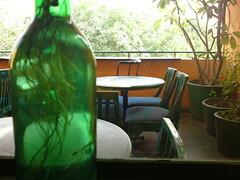 In Delhi I had a delicious lunch at Café Turtle. I don’t know if all the branches are as nice as the one above the Full Circle, a brilliant little bookstore. It’s a haven in the midst of Delhi’s chaos. But back in Bangalore, Coffee Day branches dominate, fine for coffee, loud music, so not places to hang around. Maybe I’m asking too much, but I’m still looking for a place that serves tasty small eats, fresh juice or chai and offers enough comfort for me to spend a bit of time in the company of my laptop. I hope to be able to update you on how to find the good small eats and a seat in a city where you can’t really walk for miles!